Results presented at Sustainable Brands 2017 Conference promote zero waste, zero emissions. The use of more than 550 million shared and reusable platforms and containers eliminated 2.3 million tonnes of CO2; saved 1.4 million trees; prevented 1.3 million tonnes of solid waste, versus single use containers and pallets. J.M. Smucker Company and Kroger collaborate with CHEP for greater sustainability. Detroit, Michigan – May 23, 2017 – In the work to create a circular economy – with zero waste and zero emissions between grower, producer, manufacturer, and retailer – shared and reusable assets are making a measurable difference. 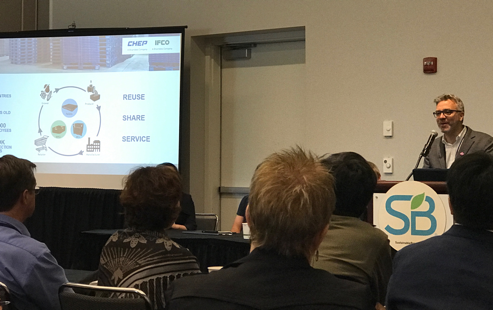 Data shared at the Sustainable Brands 2017 conference by Brambles, CHEP’s parent company, demonstrates the possibilities. According to that data, Brambles – through the operation of CHEP and IFCO shared and reusable platforms and containers – prevents 2.3 million tonnes of climate-change-inducing CO2 from being discharged into the atmosphere, eliminates 1.3 million tonnes of solid waste and saves nearly 1.4 million trees each year. As part of the Circularity as the Leading Design Principle of Our Time session, Mr. Freijo discussed that in order to achieve circularity, companies must extend the concept of design beyond the product, to that product’s global supply chain. CHEP is one of the few companies that operates a truly circular, sustainable supply chain model on a global basis. The company’s commitment to standardization and efficiently-run collection networks power the circular supply chain. In February 2017, CHEP participated in Connecting the Dots: Sustainability Through a Circular Economy at the Wharton School’s Initiative for Global Environmental Leadership (IGEL). 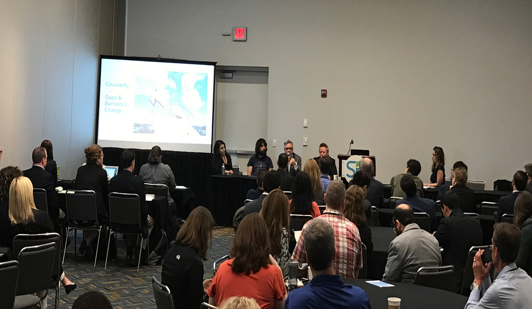 CHEP teamed up with IGEL, PepsiCo, Meijer, Amcor and Nielsen to discuss how supply chain collaboration and innovation are helping to create a circular economy that will move us more towards zero waste and zero emissions. Brambles is committed to the vision of a circular economy that generates zero waste and zero emissions. The company’s reusable assets require less timber, energy, and water than one-way platforms and containers. Their operation also emits less CO2 and generates less waste. “Brambles, CHEP and IFCO collaborate with our customers and the entire consumer products value chain to preserve our natural resources for future generations, and our shared and reusable business model is an important strategy for achieving the goal of a circular economy that represents the best hope for a brighter future,” concluded Mr. Freijo.